POD is seeking investors for its dynamic modular tents, with a brand new Seedrs campaign. POD, the pioneering camping brand which brought tents into the twenty-first century with innovative modular options, has announced an exciting opportunity for investors to own their very own piece of POD. With a new Seedrs campaign up and running, the team at POD are seeking engaged investors to join this exciting journey, as they seek to revolutionise camping even further with the new Elite POD tents. POD offers the world’s first modular camping experience, with tents designed and engineered to be linked together. For many, camping is a social activity, and the POD tents allow users to connect their tents on the fly, building bespoke accommodation layouts that suit their needs – whether they’re a family on a camping trip or a group of pals at a festival. The structure of the investment will mean that POD Tents Ltd owns all of the IP and stock for POD, and will also be compliant in the Seed Enterprise Investment Scheme (SEIS). The SEIS offers excellent tax-efficient benefits to investors, in return to investment in small and early-stage startup businesses within the UK. Investors can receive up to 50% tax relief in the tax year the investment is made, regardless of their marginal rate. POD Tents Ltd is currently seeking to raise £100,000 from investors through their Seedr campaign. The potential for POD to become the market-leading modular tent solution is enormous – and now investors are being offered the opportunity to get in at ground level and be part of this exciting new venture. For more information about the Seedr campaign, visit the campaign page: https://www.seedrs.com/pod-tents?promo_code=RKXO1RF3#qa or search for #investinpod via social media. The functionality and empowerment in giving people the ability to build what they want seems to of struck a cord on a global stage and there was even a suggestion by one site that we’d invented the perfect tent for swingers ! Here are some links from some pretty big players in the Gadget world about POD ..
After exhibiting at the European Outdoor Trade Show, the latest camping must-have product has received major coverage and interest not just in the UK, but also across Europe, South Korea, the USA and Australia. 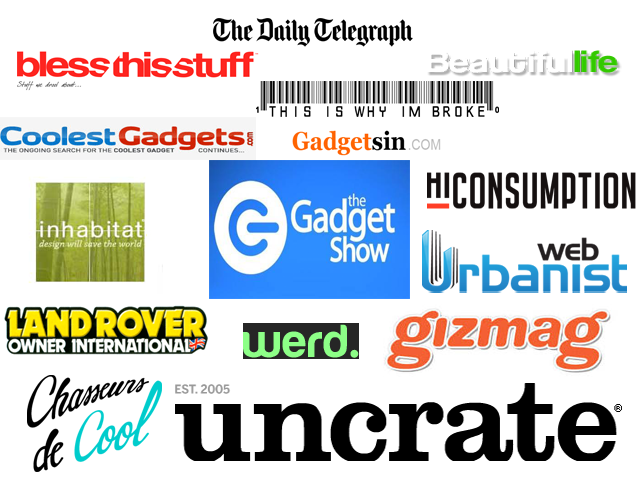 POD is now looking for global distribution partners to push the brand on all corners of the world and give POD a global audience. The all new POD Elite range will go even further to create a social camping experience with interconnecting tents. Totally innovative and stylish, further improvements have been made to the Elite range including enhanced UV protection and a lighter weight, more durable design. Functionality and fun unite in this bespoke camping product. The reason why POD has proved so popular within the outdoor leisure market is because the product is unique and fully customisable. POD tents can be externally and internally adapted to create communal living spaces and private sleeping pods for large groups. What’s more, each POD can be connected to another POD, allowing huge groups of revellers to camp together. Putting the fun back into camping, POD tents are perfect for festivals, glamping or summer family holidays. The inaugural range of tents included the POD Maxi and POD Mini, for sleeping eight or four people together in one tent with separate rooms. Happy campers can expect to see a host of exciting new features in the Elite range, along with improved durability and functionality for the ultimate camping experience. The festival camping experience is set to receive an even bigger dose of community spirit this summer as a unique British test design urgers music fans to POD their posse. POD Tents is set to revolutionise the sleeping and socialising situation at festivals for regulars on the scene, with its unique interconnecting tents that create the perfect camping community for a weekend at Glasto or V Fest. With Mini and Maxi sleeping pods that are private and personalised, and the ability to build camps in a variety of formulations and layouts, festival campsites have never been such fun. Any festivalgoer who has ever spent a weekend in the mud will understand the trials and tribulations of trying to find a good camping spot with a large group, and the encroachment of other people’s tents into your area is a minor annoyance at the best of times. The new POD Tents allow campers to connect their tents up in a number of unique formations that create a united camp, perfect for festivalgoers who have spent the day watching their favourite acts on the Main Stage. Spacious on the inside and stylish on the outside, POD Tents are the ideal companion for groups of friends heading to a festival. The tents are also incredibly flexible, so if a friend drops out at the last minute, or if someone stumbles across a spare ticket and decides to join the group, there is no need to rejig everyone’s sleeping arrangements. One less tent won’t affect the others’ ability to link up and create a camp, and anyone joining the group at the last minute need only purchase a POD add-on that can be linked with the existing tents. The tents are so effective and comfortable that they won’t be left behind at the end of the festival, like many of the cheap one-man tents that barely make it through the weekend. The high-quality materials and construction of the tents mean that festival regulars will be able to enjoy their portable campsite again and again, revelling in the social element and the privacy of their own pod at whatever music festival they end up at. 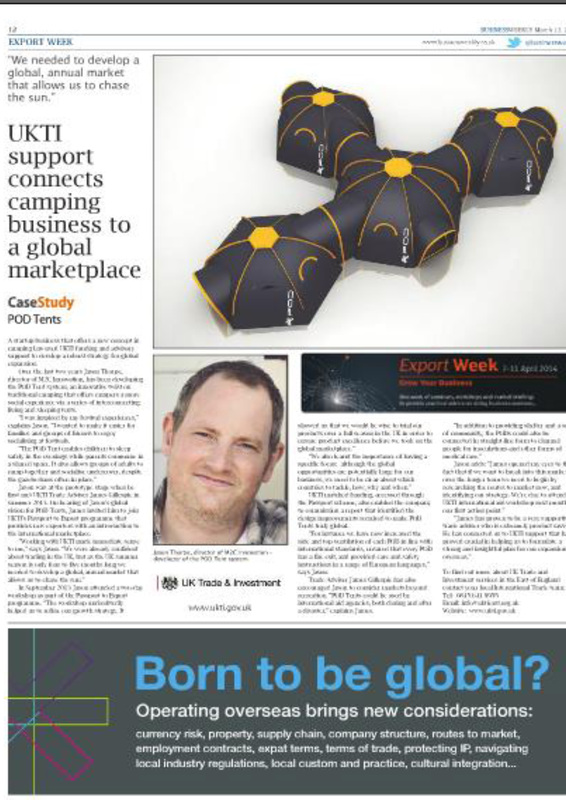 POD Tents and our MD Jason Thorpe appear in business weekly magazine this week in an article about the UKTI support we have had in making the POD tents available to a global market place. A start-up business that offers a new concept in camping has used UKTI funding and advisory support to develop a robust strategy for global expansion. Over the last two years Jason Thorpe, Director of M2C Innovation, has been developing the POD Tent system, an innovative twist on traditional camping that offers campers a more social experience via a series of interconnecting living and sleeping tents. UKTI matched funding, accessed through the Passport scheme, also enabled the company to commission a report that identified the design improvements required to make POD Tents truly global. “For instance we have now increased the side and top ventilation of each POD in line with international standards, ensured that every POD has a fire exit, and provided care and safety instructions in a range of European languages,” says Jason. A revolutionary range of interconnecting tents are set to become this year’s glamping must-have, as new statistics reveal that 15% more people are opting to stay in the country and enjoy their holiday on home shores. The POD tent is helping thousands of UK residents to find beauty in their home country and enjoy a fun and friendly holiday, with their interconnecting passageways and unique ability to morph into bespoke accommodation, wherever they may be. Camping can often be a solitary experience, especially if you only own a one-man tent. The POD tents are helping to redefine camping for those who love spending time with their nearest and dearest and enjoying the great outdoors. Each tent can be connected up with a neat corridor, with an unlimited number of formations to choose from. Up to 20 people can be accommodated, so your next camping trip needn’t be a trip for two to a remote peak; invite the entire family and get your POD on. POD tents are suitable for all types of camping groups and parties. Friends going on a camping holiday will surely need a communal socialising area where they can hang out, play guitar and swap stories after dark. With one POD tent in the middle, and corridors leading to each person’s individual bedroom, this social camping dream is a possibility. For families heading on a camping trip with young children, it is important for the adults to be able to check on their children without venturing out into the dark and stumbling to their tent. POD tents make this a possibility, allowing parents and children to have adjoining bedrooms that still offer an element of privacy. POD campers can effectively build their own community and take it on the road with them. Backpackers will revel in being able to pitch up in different formations every time, families can have fun with their children enjoying the different ways they can pitch their PODs, and casual campers can invite along friends and other loved ones without worrying about whether they have their own camping gear. The POD revolution has begun, and avid glampers all over the country are loving it! 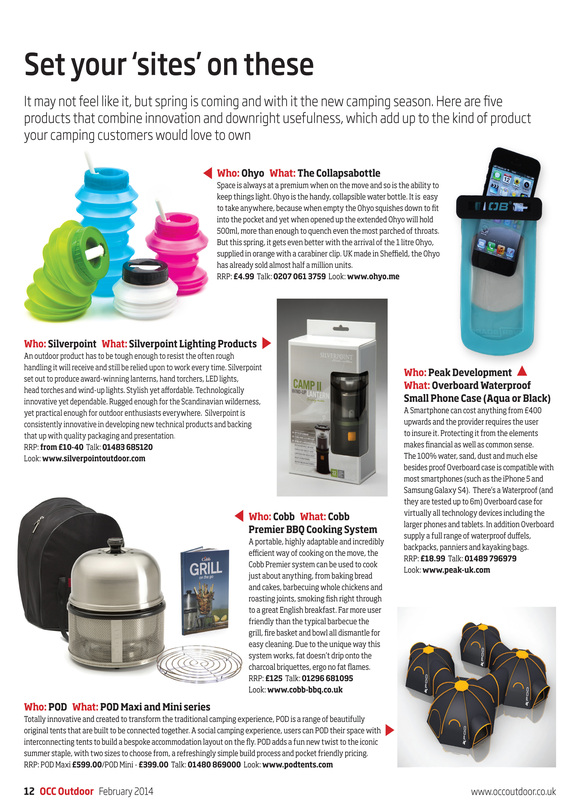 POD’s have been listed in the February edition of the OCC Outdoor magazine as a product to set your “sites” on in 2014 , OCC is Britain’s only monthly outdoor industry publication and can also be viewed on online www.occoutdoor.co.uk . Whether they intend to live it up at Glastonbury or whether they’re attending a local event like Manchester’s Parklife or Hampshire’s Blissfields, the winner of the POD Tents Facebook competition will be the envy of all festivalgoers, with their interconnecting corridors, their private socialising areas and their uber-comfortable private bedrooms. Entry to the competition is simple: those who want to spend their festival in a swish complex of POD Tents need only like the POD Tents Facebook page, write on their wall stating which festival they are attending, and tag all of the friends that will be accompanying them. Simple! POD Tents are a unique creation which turn camping into a completely shared experience. Instead of creating a makeshift campsite with small tents dotted around in the same area, POD Tents offers campers the opportunity to build their own camping community, with interconnecting corridors, personalised sleeping pods and the ability to create comfortable shared areas, perfect for festival socialising. Those who aren’t lucky enough to win the Facebook competition are still encouraged to look at the benefits of investing in a complex of POD Tents. Rather than a group of ten friends splashing out on one-man tents that they will inevitably discard at the end of the festival, the POD Tent solution allows everyone to pitch in and have an interconnecting series of tents that can be used year on year. Not going to a festival next year? No problem – simply hire your POD out to a friend who can then join up with the group. Bringing along someone extra? Welcome them to the camp with the presentation of their very own sleeping pod. POD Tents are a failsafe festival solution, and the Facebook competition is set to make one lucky group of festivalgoers the envy of everyone around this year. The POD Mini is a smaller four person tent, sleeping inhabitants comfortably with or without private sleeping cells. 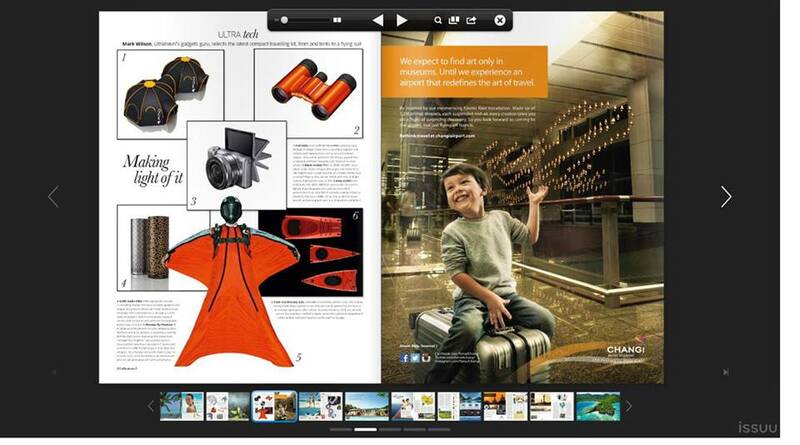 The new, revolutionary POD designed by M2C Innovation is different. POD is a social camping concept that enables tents to be interlinked in order to build a community. Perfect for a growing family, each family can have their own sleeping POD resulting in undisturbed sleep and meaning that you don’t need to buy a larger tent as your family expands – just add another POD. With interconnection tunnels you can safely party into the night with friends whilst staying close to your loved ones – the best of both worlds! A modular design means that you can have a central POD for living in the day and separate internal or external sleeping PODs. Whether you are a welly wearing festival goer, a hardened British camper or enjoy camping further afield POD is the perfect companion.